Offer a touchless way for guests to dispose of waste with an open top trash receptacle. The dome top features a sanitary and convenient pitch-in disposal opening. These open dome top receptacles are a popular choice for high volume lobbies and specialty beverage shops. Lift-off top makes servicing the galvanized liner a snap—the liner is included. 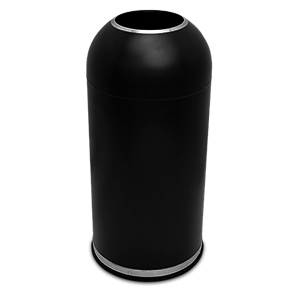 The base has a durable plastic molded trim that protects the trash can bottom and floors.